The Gurkhas are world famous as fearless fighters in battlefields. This is a story of what kind of people they were and are. If you have Gurkhas on your side, it gives your enemies a big fright and for you personally, great comfort. They are people from the Himalayas. There are none like them anywhere in the world. IN the last 100 years of modern warfare, the image of one group of soldiers looms mightily ahead and above many others. They are the Gurkhas. The Gurkhas are natives of Nepal, specifically from the Pahar or Hill Region of Nepal. This hilly area covers 64 per cent of Nepal and it is from here that some of the finest Gurkhas are recruited. The reputation of the Gurkhas today is firmly entrenched in the battlefields of past wars and conflicts. They have served magnificently under the British flag in the jungles of Malaya, in the Falklands and other lands that have seldom known peace. John Parker's book on the Gurkhas has cast a floodlight that reveals the ancient roots of a fierce, courageous fighting race of people who believe that it is "better to die rather than to be a coward". Thus, the Gurkhas' motto, "kaphar hunnu bhanda marnu ramro", reflects the spirit of the hill tribesmen who have seized the magination of all the adversaries who have dared to face them, and won the admiration of the world populace who have heard or read about their exploits. The journey into Gurkha military history can be traced to Gorkha, located 19km north of Kathmandu on the Pokhara road. At this place lies the Gorkha Durbar. It is a palace as well as a fort, considered by many to be the shrine of shrines. It is a monument to the Gurkha and Nepali heritage. The origins of the Gurkha are found in the House of Gorkha, about 260 years ago. It is where the most famous of all the kings was born - Prithvi Narayan Shah. The roots of the connection between the British and the Gurkhas began with Prithvi Narayan. He fought the King of Patan in his Gorkha expansion campaign and earned for his people the formidable reputation of being fearless fighters. 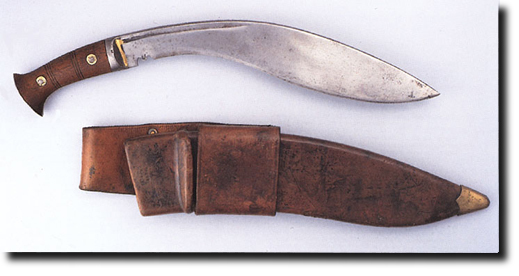 And in the mists of time, when much blood was shed by all sides, particularly by those who fought the Gorkhas (later the Gurkhas), the swirling, short and stout knife called kukri gained its fame. Today when the name kukri is mentioned, it never fails to conjure up images of severed limbs, decapitation and a sudden flash of steel that brings instant death. John Parker extracted information from more than 40 taped interviews conducted in Britain and Nepal from 1997 to 1999 for this book. He also researched personal diaries, memoirs, correspondence and materials from the archives of the Gurkha Museum in Winchester, England. This 369-page treasure-trove of facts, tales and stirring information on the Gurkhas is guaranteed to hold the attention of anyone who knows and admires the Gurkhas for their bravery and fighting skills. The Gurkhas contains anecdotes and documented proof of some of the bravest Gurkhas ever to fight on the battlefields of Southeast Asia and beyond. For example, Rifleman Ganju Lama, who enlisted into the 7th Gurkhas in 1942, was one of a large number of Gurkhas who received the Victoria Cross for courage beyond the call of duty. The citation reads that Ganju single-handedly took on three Japanese tanks, firing point blank, and emerged victorious. Ganju ran, crawled and engaged the enemy despite a broken left wrist, a wound in the right hand and another in the leg. The citation further reads: "In spite of his serious wounds, he then moved and engaged with grenades the tank crews who now attempted to escape. Not until he had killed or wounded them all, did he allow himself to be taken back to Regimental Aid Post to have his wounds dressed." At the author's last recall, Ganju Lama, Victoria Cross recipient, was still living somewhere in the mountains of Nepal. The Gurkha reputation is built upon legendary tales of their disinclination to take prisoners, much like the French Foreign Legionnaires. British army officers who have commandeered Gurkhas have told of Gurkhas who wore the look of death on their faces as they charged into enemy ranks, usually striking fear in the hearts of the opposing side. Those who fought the Gurkhas in World War II, and are lucky to be still alive, have confirmed the harrowing accounts of encountering these legions of death, who came down from the Himalayas to the fight relentlessly and courageously in the valleys of death below. This book is not to be taken lightly by all men of uniform or by anyone who has an inkling of the kind of danger that fighting men face. The story of the Gurkhas has been told admirably well by Parker. It is full of excitement. It is filled with tales of the actual events that have shaped a nation and propelled the Gurkhas into the hallowed halls of fighting fame. Today, the Gurkha legend continues to spread and grow through books like this one. It is a tale often told, though in different ways and by different authors. But the message is the same: Gurkhas are a formidable force in any battlefield and if you happen to be on the opposing side, God help you.